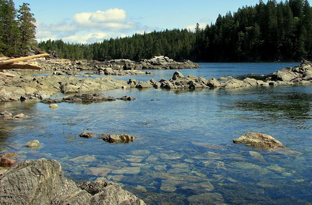 • Intertidal ecosystems range and vary from cobble and rocky beaches to open mud flats. As the tide ebbs they are exposed (to varying levels) usually twice every 24 hours. • The species living in intertidal ecosystems are salt-tolerant and hardy; they must live with the influences of tidal saltwater, as well as prolonged periods of exposure and drying. 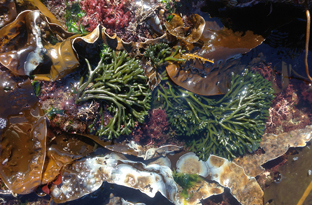 • Intertidal ecosystems are used by many transient species (including humans) for foraging and travel. 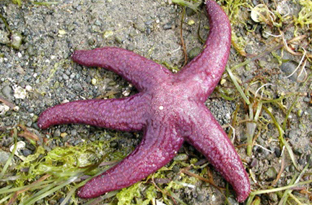 DIEM has mapped Intertidal Ecosystems purple in the Sensitive Ecosystems Mapping. 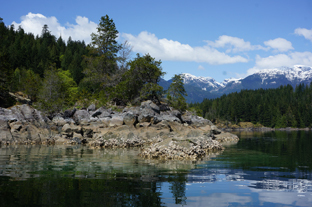 Intertidal ecosystems in the Discovery Islands occur along beaches in small protected bays and inlets and also on rocky shorelines. These ecosystems are strongly influenced by tides that ebb and flow at roughly six-hour intervals. They are regularly covered by salt water and they usually receive freshwater only through rainfall and in some areas, from shoreline runoff. 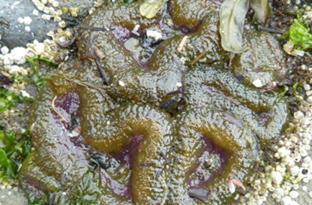 The surface of intertidal ecosystems may vary from complex vegetated marshes to shimmering mud. The hardy plants and animals that inhabit this ecosystem must tolerate salt water and withstand daily exposure and drying; and they must be endure mechanical damage from waves, moving sediments, and floating debris. 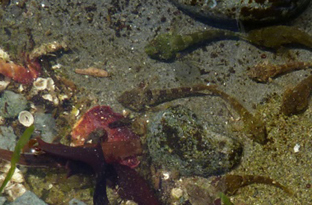 Each intertidal species survives a particular range of conditions, leading to distinct zones zones—splash, high, mid- and low- tidal—and different concentrations of species. 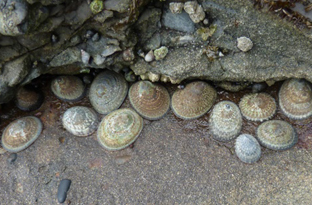 The greatest diversity of animal life is found in the low intertidal, where conditions are the most consistent. 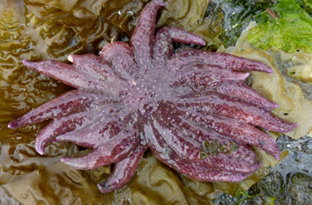 True plants, with the exception of eelgrass, are usually confined to the splash and high tide zones, where inundation by salt water is infrequent. 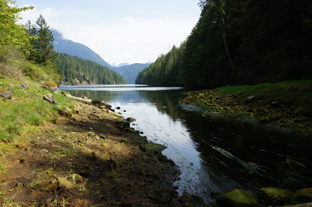 PROTECTED BAYS AND INLETS often have beaches made of fine sediments, such as sand or mud. Others may have cobble beaches. EXPOSED SHORELINES featuring rocky intertidal areas are dominant on many of the Discovery Islands, including Marina and much of Cortes. STEEP SHORELINES with almost no intertidal ecosystems are found on the Redondas and on Raza and Stuart islands. SPITS are finger-like extensions of land comprised of sand or gravel deposited by longshore drifting. While they’re often well vegetated above the high water mark, their intertidal areas are considered sparsely vegetated ecosystems, with low to moderate cover of salt-tolerant grasses and herbs. 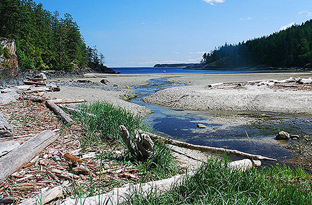 WHEN YOU EXPLORE intertidal ecosystems take care of beaches – they’re fragile! Avoid walking on plants, seaweed, eelgrass beds, and shellfish. If you pick up shore rocks, always put them back the way you found them, otherwise you expose the animals taking refuge beneath. 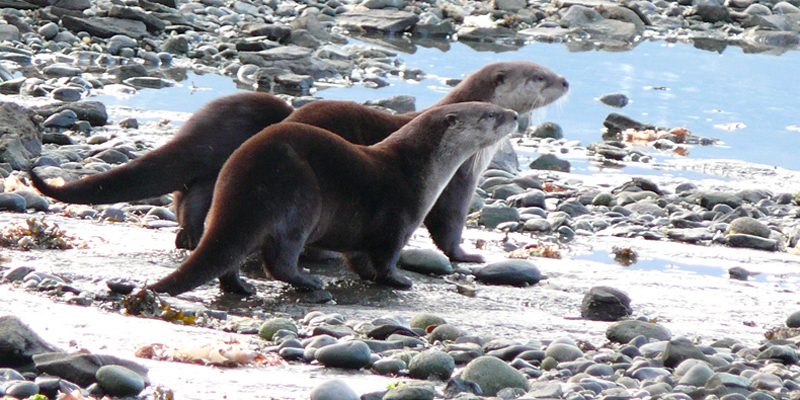 They are creatures of the “edge” and on the coast are best called “coastal otters” as they forage mainly in the fish-rich marine environment. 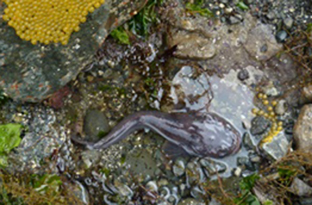 They are often seen crossing the intertidal to shoreline dens or scent-marking sites. To keep the insulating qualities of their fur, they wash daily in fresh water, often in seeps along the shoreline or in adjacent creeks or ponds. 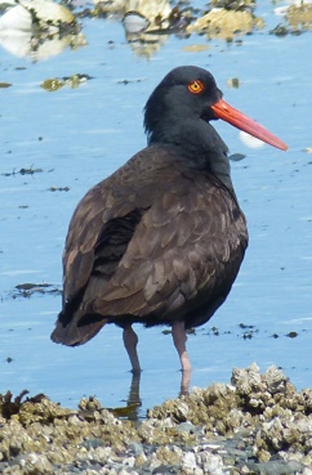 The black oystercatcher’s narrow pointed orange bill is uniquely adapted for intertidal foraging, prying invertebrates like limpets and mussels off rocks and opening them. Their nests are completely vulnerable to disturbance in shoreline depressions, but the eggs are hardy and can survive washing by high tides. The chicks move off as soon as their down dries. 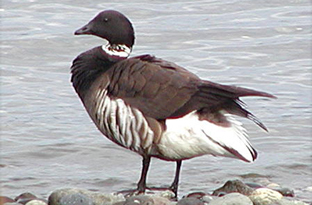 Black brant geese are smaller than Canada geese and have a necklace of white feathers. In spring, on their way from Puget Sound and Mexico, they migrate by the islands’ shorelines stocking up on eel grass and marine algae to have energy for the trip and for breeding in salt marshes of the high arctic. 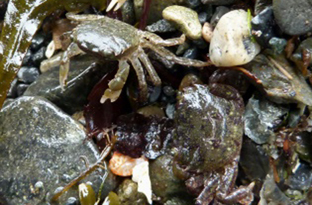 Numerous and various crabs inhabit the intertidal. 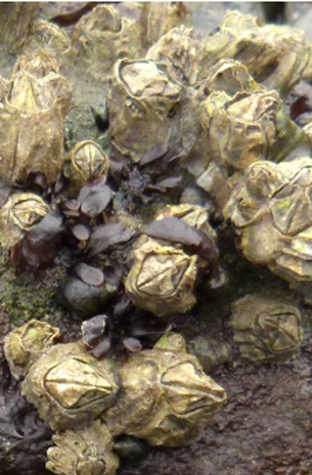 A flowering plant that grows from the lowest intertidal to 6m subtidal, often on shifting muddy or sandy substrates where stems can be relatively easily dislodged. 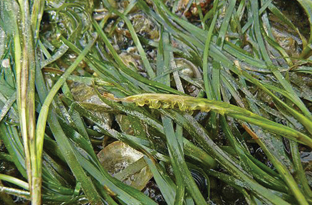 Eel grass beds are significant nurseries for marine-life, providing both protection and food and the leaves are important as a substrate for herring spawn. 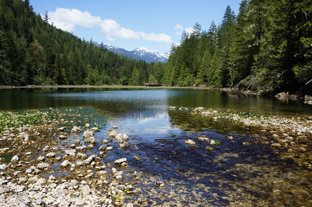 The plant is also designated “essential habitat” for juvenile salmonids. 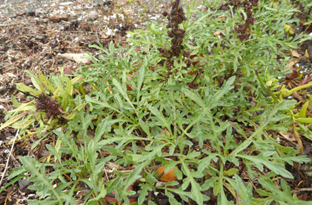 Rhyzomes and leaf-bases were eaten fresh or dried by First Nations. A tall noticeable succulent on beaches, whose white inner leaf-bases were eaten as a spring vegetable. 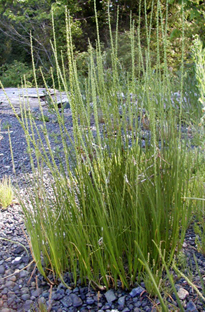 But the plant contains cyanide-forming glycosides that can be poisonous. There are many nicknames for this tasty saltwater plant. The official name of sea asparagus is Salicornia, but it’s also known as sea bean, pickleweed, or samphire – and tender new stalks of this succulent are eaten as a green vegetable. The ashes of Salicornia yield sodium carbonate alkali and until the early-mid 1800’s it was also used for the commercial manufacture of glass and soap. 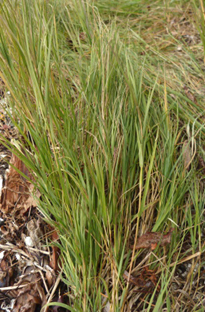 The sharp pointed penetrating underground roots or rhyzomes help this grass form a sod-cover on various beach surfaces. The distinctive upright overlapping-leaf flattish stems provide protective habitat and food for wildlife, especially waterfowl on beaches. 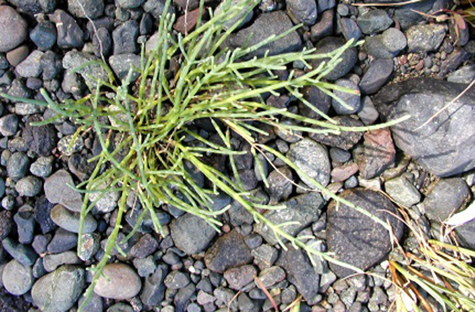 It grows on gravely or sandy beaches as clumps of sprawling branches with somewhat succulent curly-edged, pointed leaves with spikes of greenish-yellow flowers.